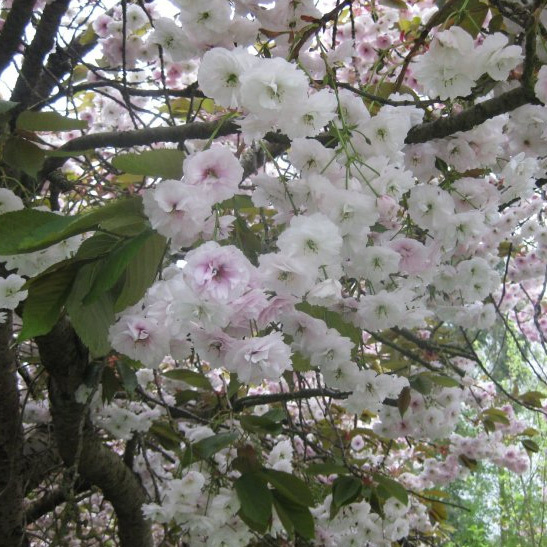 Shrofugen is identifiable by its pink buds which engulf the branches in spring, opening up into fragranted, large double white blossoms which change to pink as they age. The young bronze-coppery leaves turn to dark green in summer and then to copper red in autumn. Shirofugen has a attractive spreading habit and its umbrella-like canopy make this a well-liked and popular Japanese flowering cherry tree. When compared to many other flowering Cherry trees, The Shirofugen is considered a fast grower which is ideal for the impatient gardeners out there. Another plus point with this Cherry tree is that it is one of the latest and longest to flower so if you have a garden with other flowering Cherry trees then this will extend the visual pleasure for you. As with most things as they age, the Shirofugen may start to droop or arch downwards as it gets older. This stunningly beautiful white flowering cherry tree is similar to Shirotae (only growing to 6m or 20ft) at the ten year point. It may go on to grow some more but this is purely down to weather and local soil conditions. Manual pruning will of course keep the ultimate height down but if you want to let it grow then pruning is not needed unless you want to take out a few branches here and there to stimulate new growth. Shirofugen is supplied at a height of between 1.5m (5ft) to 1.7m (5ft 6in) and in a 12L container, which means that the tree can be planted any time of the year and with better results than either bare-root or rootballed trees. If you are interested in how the Shirofugen got to Europe then you need to look up Ernest Henry Wilson. An avid plant explorer responsible for bringing back over 60 forms of flowering cherry and many more. Information on him can be found on Wikepedia under Ernest Henry Wilson 15 February 1876 - 15 October 1930. Ironically, he was killed in a road traffic accident aged 54.